Mid-2014 FPC optimized and secured the supply chain regarding packaging at Philips Healthcare with the implementation of PackAssist. Click here for a video interview with Eric Ermstrang, Director of Global Transportation & Packaging at Philips, in which he tells about his experience with FPC and PackAssist. FPC started working to also secure the packaging process “upstream” in the supply chain of Philips, by connecting UPS chain partners. Recently FPC connected UPS Louisville (USA) to PackAssist for repacks of the spare parts of Philips Healthcare. 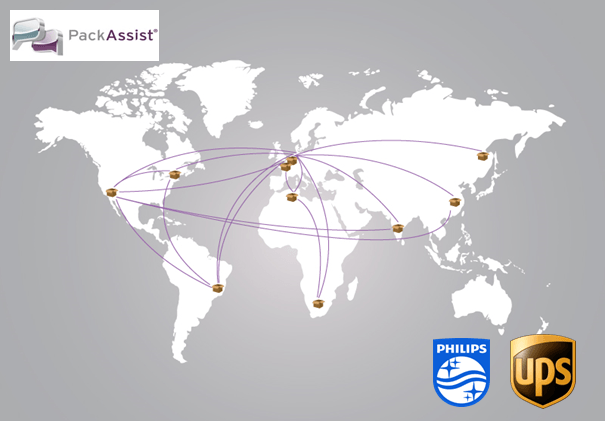 After connecting UPS Singapore last month and UPS Roermond in an earlier stage, the 3 main worldwide spare part distribution centres of Philips Healthcare are now completely connected to PackAssist. We cannot emphasize enough that when synergy with chain partners is realized in this way, a real difference can be made. By connecting chain partners to the same system (PackAssist) it is clear how Philips wants their parts to be packed on those locations too. This causes less packaging errors and clear and consistent communication. For Philips Healthcare this contributes to a DOA-free and efficient packaging process for the complex spare part supply chain. At first the standardization of packaging types has been carried out further causing that Philips encounters less packaging specifications in her logistic flow. Due to the proactive communication that PackAssist offers less repack actions are necessary, this saves time, annoyance and cost. “In the past it took up to 4 weeks of training with Philips employees on location to connect a new chain partner to our packaging concept. With PackAssist this can be done in a few hours, by only using online communication.” according to Eric Ermstrang, Director of Global Transportation & Packaging at Philips. The recently connected UPS chain partners also take advantage of PackAssist because they can also work with visual packaging instructions now. This is ideal in the UPS distribution centres. They work with a flexible pool of employees and therefore training of employees can take a lot of time. “I never receive questions from my staff about people not understanding PackAssist.” according to Giovanni de Bruijn, teamleader at UPS Roermond. The harmonized packaging policy already resulted in a considerable packaging volume reduction for UPS Louisville. Before, different packaging sizes where used interchangeably for the same part. Now, with help of PackAssist, the size of the packaging is adjusted to the size of the part. This makes sure that less “air” is being transported and this also results in lower transport costs. The coming period FPC will continue to connect the UPS distribution centres in Shanghai and Tokio to PackAssist. Do you want more information about FPC and our PackAssist tool, contact us for a non-binding introduction.